Mega Sale! 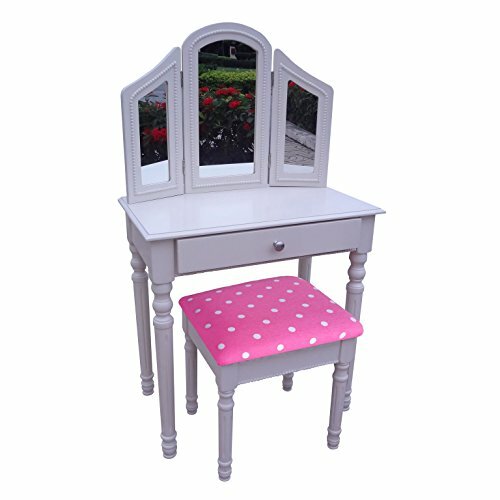 Save 27% on the Kinfine Youth Vanity Table and Stool Set, Cream and Pink by Kinfine at Indsight. MPN: K7002. Hurry! Limited time offer. Offer valid only while supplies last. Every little girl will want this fashionable purple Vanity set with upholstered seat in a fun pink printed fabric. Easy assembly. Spot clean fabric. Every little girl will want this fashionable purple Vanity set with upholstered seat in a fun pink printed fabric. Easy assembly. Spot clean fabric. Maximum weight capacity 150 lbs. Table Dimensions 24”lx14”wx42”h, stool Dimensions 14.5”Lx12.5”Wx15.5”H. Some assembly required. With actual mirror not acrylic.